Interactive and smart display system of an intelligence building is in a fast growing phase. Winmate 10.1” Multi Touch Flat Panel PC (W10ID3S-PCH1 and W10ID3S-PCH1-PoE) is designed to fulfill the needs from this growing market. Slim, stylish, and still rugged. The design of Winmate 10.1” multi-touch Panel PC is simple and elegant with round corners and curved back cover. 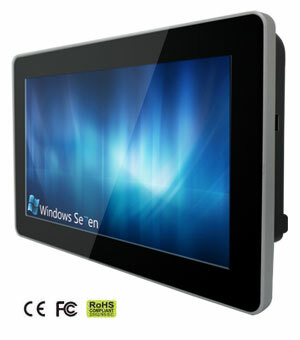 Special mounting designs make this Panel PC can be easily mounted under different environments. Adopting Intel Cedar Trail solution, this PPC provides a quieter and low power-consumption choice with its fanless design. Besides the reliable core processor, W10ID3S-PCH1 is equipped with true flat screen, metal housing, and front IP54, making this PPC a great option for diverse industrial and business applications. Winmate 10.1” P-Cap PPC is suitable for home automation and room management systems, and can be used in office, campus, or conference center. By connecting to centralized database, it can provide real time update for booking status and available schedule, or perform as a synchronous display in meetings.